The Rev. 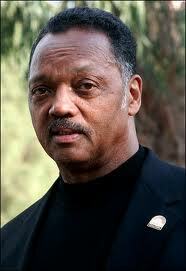 Jesse Jackson is an American civil rights activist and Baptist minister. He was a candidate for the Democratic presidential nomination in 1984 and 1988 and served as shadow senator for the District of Columbia from 1991 to 1997. He was the founder of both entities that merged to form Rainbow/PUSH. Representative Jesse Jackson, Jr. is his eldest son. In an AP-AOL "Black Voices" poll in February 2006, Jackson was voted "the most important black leader" with 15% of the vote. Learn more here. "Many years ago in the late 1970s, I visited South Africa, then deep in the throes of apartheid. I was asked by the media what I thought of the situation, and I said, 'I believe in human rights for all human beings. We must measure human rights by one yardstick.' That principle — our moral center — still applies. Everything flows from this perspective. "We stand together today as equal members of the human family…. as consistent principled advocates for human rights for all people. We stand together today to uphold the principles of due process, of equal protection under the law, of fighting against discrimination against any and all people based on race, religion, gender or sexual orientation. "We stand with you today to support Marriage Equality, and to declare that Proposition 8 must be struck down as unconstitutional. Peoples’ right to self-expression, self-determination be respected and affirmed. It’s time to challenge ignorance, a time to break the silence and the chains of hatred, of divisive and discriminatory bigotry. 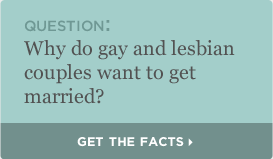 Marriage is based on love and commitment – not on sexual orientation. I support the right for any person to marry the person of their choosing. "If Dr. King and our civil rights movement has taught us anything, it’s the fundamental principle of that all people deserve Equal protection under the law. LGBT people deserve equal rights – including marriage equality – and equal protection under the law. Discrimination against one group of people is discrimination against all of us. The State – and the Courts — should not sanction discrimination. "To those that believe in and fought for civil rights, that marched to end discrimination and win equality, you must not become that which you hated. It’s past time to exist in hypocrisy and ignorance, and time to come out of the shadows and darkness to support unequivocally, equality for all people. Those that support civil and human rights cannot, must not, become perpetrators of discrimination against others based upon race, religion, culture, sexual orientation. "African-Americans know too well the sting of legal, state sanctioned, constitutionally driven 'second class' citizenship – from centuries of legal slavery and Jim Crow segregation, to classified as 3/5 of a human being in the U.S. Constitution, to facing anti-miscegenation laws that prevented blacks from marrying whites. "We cannot not sit idly by while Prop. 8 seeks to target gays and lesbians for a disfavored legal status, as America’s newest 'second-class citizens.' Our legal scholars have cited fourteen times where the Supreme Court has stated that marriage is a fundamental right of all individuals. That principle must be upheld today – for blacks and whites, for straight and gay, for ALL Americans. No group of people should be denied their fundamental constitutional liberties, like equal protection under the law, simply because of who they are. "So today, we do not stand alone. It’s time to go forward by hope and not backward by fear, to stand up with courage, hope and strength and send a shout out for equality. Stiff winds of resistance seek a return to intolerance, bigotry and state sanctioned discrimination – whether against immigrants in New Mexico or against marriage equality in California. It should only strengthen our resolve to defend equal protection under the law, equality for all Americans, and the forging of a One Big Tent America. Freedom to Marry salutes The Rev. Jesse Jackson as a Voice for Equality! If Rev. 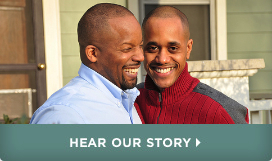 Jackson's support inspires you, take action by and by signing the Freedom to Marry Pledge.